WELCOME TO A COLLECTION of books I've written about angels, unicorns. goddesses, leprechauns and whatever else you see below. Click on the covers for more, or HERE if you'd like to email any comments. 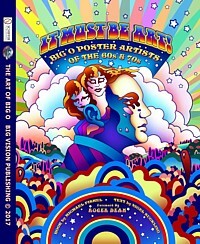 Published in September 2018 is It Must Be Art, a second revised and expanded edition of The Art of Big O from a few years ago. It probably really belongs in the Fantasy Art section but for various reasons it feels more at home here. It tells the story of Big O Posters, the wonderfully creative London company whose posters documented and to some extent shaped the youthful creative explosion of the late 60s and 70s. Here we've collected much of that art and also traced the careers of many of the artists concerned after the company's demise in 1980, so it's not just a catalogue of published posters but an account of the kind of art they gave rise to. Much of the story is told in the artists' own words but I've filled in the gaps where needed. The first edition is still available on Amazon and elsewhere, but the good news is that the second one has been expanded and much improved, courtesy of Schiffer Publishing in the States. Go to my INTRO page for more details. Click HERE for an article about the project and HERE for a review. Or to hear me talking about why it is such a great idea click HERE. On the right is the Winter 2014/15 issue of Illustrators magazine which carried an article about Big O and the book. Click on it for the article. 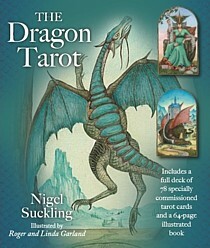 FEBRUARY 2018 SAW THE PUBLICATION of a third edition of The Dragon Tarot with the most wonderful illustrations by Linda and Roger Garland showing dragons in all their splendour and variety. This pack was a real labour of love at the time, so it is a serious pleasure to see it back in action again. Click on the cover left for more about it. Thanks to a fierce deadline it was also a labour of blood, sweat and tears, particularly for Roger who produced the bulk of the illustrations. 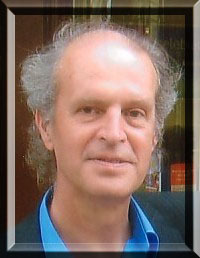 Cruelly Roger died of motor neurone disease in October 2017. 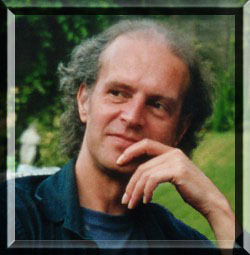 Click HERE for a well-deserved tribute to him on the Tolkien Society website. NEXT COMES A WONDERFULLY SATISFYING venture that was published in March 2011 and gave a chance to pick up from the book on angels I wrote about ten years before, along with other strands of interest. Many thanks to Cindy Richards of Cico Books in London who offered the chance to write it, and Sarah Perkins for the atmospheric illustrations. 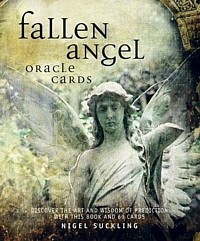 It is a pack of beautifully illustrated oracle cards calling on fallen angels who are on the side of neither God nor the Devil in the current ideological wars. They are interested, disembodied and often demonized spirits who sympathise with all sides of the biblical religions and are shared by all their Books. The angels' co-operation in creating the cards was really quite extraordinary. Try them and see for yourself. THEN COMES A BOOK I waited about thirty years for the chance to write. 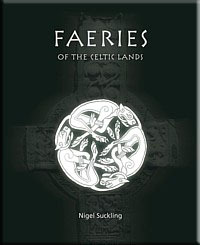 Faeries of the Celtic Lands traces the origins of the Celtic beliefs about faeries back to the misty days of their first arrival in Ireland, apparently descending from the sky in flying ships and landing on the mountain tops amid a great cloud that shrouded the land for three days. According to legend they then ruled the country as gods for an age before being forced to retreat into a parallel world, or sail away westwards across the ocean like Tolkien's elves. I did hope to have the John Duncan (1866-1945) tapestry at the top of this page for the cover, but getting permission proved too complicated. And as it happens the actual cover captures the feel of the book very well in a quite different way. I only came across Duncan's art while working on Faeries. He was one of the most influential Scottish painters of the late 19th century Celtic Revival movement. The book was published in the autumn of 2007 and at 224 pages is a fair bit longer than most I've done, in proportion to my interest in the topic, though without anywhere near exhausting it. The aim of the book is to give a kind of overview of the subject for those who are curious and even quite well informed about Celtic mythology, but daunted by its abundance and seeming chaos. 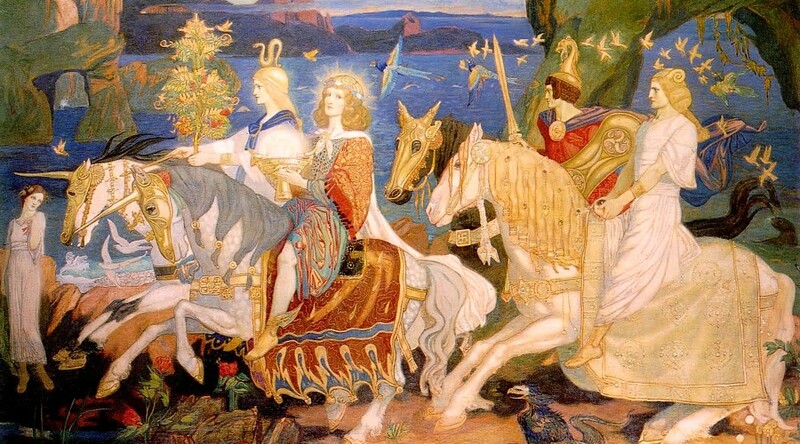 Also to examine how the basically pagan ideas in the faerie faith nevertheless managed to survive and prosper alongside Christianity right up to about a century ago when other forces undermined the solid belief in faeries in the Celtic countryside. Click on the cover for some sample pages. 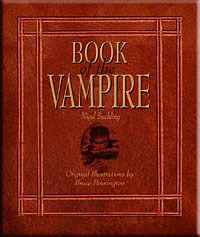 BY WAY OF CONTRAST, the follow-up for autumn 2008 was the book on vampires you see on the left. It wasn't quite as long in gestation as Faeries but I wrote it on and off for a dozen years and it is wonderful to see it in print at last, with Bruce Pennington's original black and white drawings. In person Pennington is the most mild and optimistic person, but he just happens to have a wonderfully gothic imagination and is at his best when depicting demons and disasters. 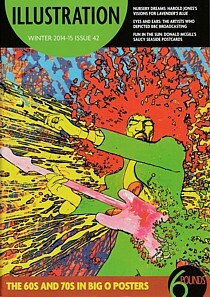 To see a selection of his work, including illustrations from this book, visit his website HERE. To view some sample pages from the book, click on the cover. 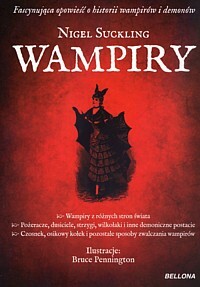 In 2012 the book was published in Polish by Bellona Books of Warsaw. It's also available in the UK through Amazon. As with the original edition the illustrations are by Bruce Pennington. THE IDEA FOR DOING THIS BOOK first came from being asked to write an introduction for a reprint of Sabine Baring-Gould's classic 1865 Book of Werewolves, because I was taken by his curiously healthy angle on an equally morbid topic. There was something so refreshingly wholesome about it that I wondered if something similar could be done with vampires. So that is what I set about doing. Curiously, many of the sources I delved into were the same as those I used elsewhere for a book about angels. Then below we have a little halloween trilogy that came out in 2006. Each book is 96 pages long and about the size of a standard paperback but beautifully presented with a hardback and dust cover. The idea of the format is to present the facts in juicy little bites, so to speak. The Vampires volume is a kind of taster for the much larger book above and there is inevitably some overlap, but I tried to avoid repetition so this should not spoil your appetite for the larger book and it contains many additional titbits. It was fun to have a look at werewolves and witches as well. These three books (plus some others) are now available as Kindle eBooks fom Amazon. Click HERE and scroll down the page. As a bonus I got to do another book about unicorns, which links in a nice circular way with the first book in the next section below. Below are some earlier and more fully illustrated volumes in which I mostly worked in tandem with the artists. Most were illustrated by Wayne Anderson, three by Linda and Roger Garland and one by Bob Eggleton. Visit the Fantasy Art shelves for more of their pictures as they are all artists I first interviewed for collections of their work. but I've posted samples of it here anyway. Feel free to EMAIL if you have any comments. Chuang-Tzu once dreamed he was a butterfly. or a man who had dreamed he was a butterfly . . .